SuperAntiSpyware Protection from installation or re-installation of potential threats as you surf the Internet. Advanced Detection and Removal : Detect and Remove Spyware, Adware and Remove Malware, Trojans, Dialers, Worms, etc. Light on System Resources and designed not to slow down your computer. 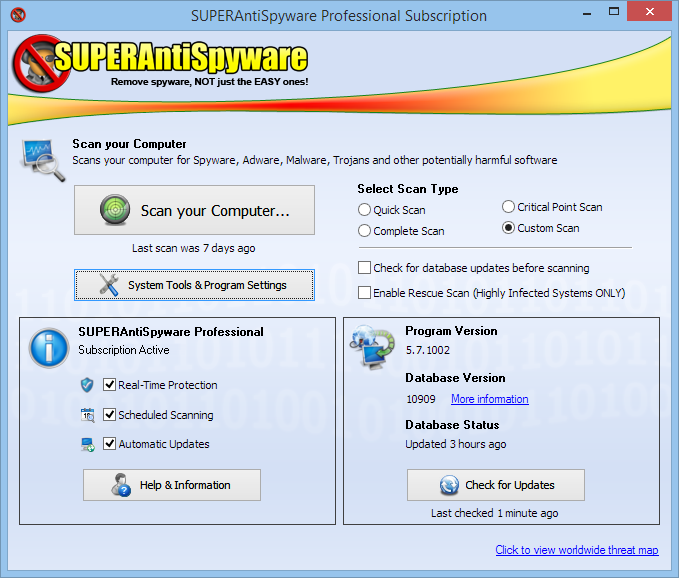 NEW SUPERAntiSpyware Version 5.7 - Significant Updates! Identifies potentially unwanted programs and securely removes them. Provides an even easier user interface by putting key tools, such as quarantine management, scan logs, and repair features in one place. 0 Response to "Download SuperAntiSpyware 5.7"